We last looked at the full list of Maple Leafs cap hits before the draft. Since then, much has changed, including some trades, some signings, and with about two months to go before the start of training camp, the Leafs have enough players signed at all positions to put a 23-man roster together. Only the cap hits of the 23-man roster count against the cap, along with some odds and ends of extras. 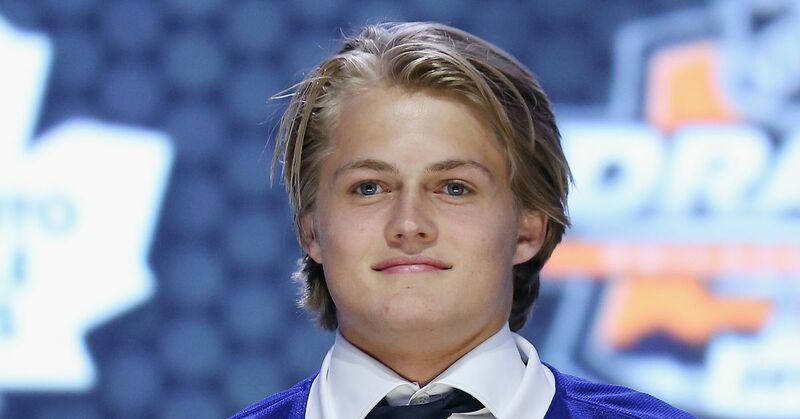 The bottom line, $12 million and change, is much more than enough to contain Nylander’s contract. Bear in mind that the Leafs can spend that full $12 million, then assign Nathan Horton to LTIR, and have a pool of $5.3 million to use to add even more players. The arguments for and against doing that largely revolve around ensuring that performance bonuses that might be earned this season get absorbed by this season’s salary cap and don’t roll over into 2019-2020. Bonuses cannot be absorbed by the LTIR pool, so to avoid a bonus carryover again, the Leafs would have to stay under the cap with Horton’s salary figured in, and in addition, have the cap space at the end of the year to cover those bonuses. Only players on 35+ contracts or on their ELC can have performance bonuses, so there will be fewer overall and fewer large ones to consider in the future. The most likely players to ever earn their bonuses are the top-level young players who have an opportunity to hit the scoring thresholds, be named to the all-star team, or win awards — Marner and Matthews, in other words, and this is their last year on an ELC. Most bonuses are never paid, and the real probability for the Leafs is that they will owe around $3 million or so in bonuses over the course of this season at most. For many people, the risk associated with rolling $3 million into next year and making the cap situation tighter in that year is so high, and the reward of spending the upwards of $10 million in cap space and LTIR pool now on someone is so low, that they believe now is the time to be prudent and get the bonuses wrapped up under this year’s cap. I’m not one of those people. I think the idea of foregoing that very large amount of room as a matter of principle, that is to save $3 million next year, is a dramatically overly conservative view of the situation. The roster is not so fixed that there aren’t other ways to deal with next year’s cap, and the view now is not always what it will be then. After all, the last time we looked at this list, Matt Martin was on it. To put it bluntly, if there’s a cap crunch next year, $3 million isn’t going to solve it. To put it more bluntly, if you sign John Tavares to a seven-year deal, you have an obligation to put the best possible team on the ice for every single year of that seven. However, if there is no good opportunity to use that space, then fine. It’s not like this roster isn’t excellent as is. You shouldn’t spend cap space just for the sake of spending it anymore than you should save it for later when you should be contending. If the Leafs do stay under the cap all season, then the space will accrue and the cap space to add players at the deadline will be massive, and anyone would fit as a rental, no matter how expensive their cap hits. Deadline deals cost assets, however, and assets are something the Leafs don’t have in excess. That is exactly the conundrum the Leafs face right now. There are no UFAs of value right now, but they could trade for any one of the list of 2019 UFAs on the market who would improve the team, even knowing they might have no hope of keeping them. Jeff Skinner, Max Pacioretty, Erik Karlsson, and perhaps Wayne Simmonds, are all rumoured to be obtainable. There might be others we don’t even know about. Why not load the team while half of the Big Four are on ELC wages? If the Leafs were awash in picks and prospects, it might be a good choice. If the deal is good enough, it might still be a good choice — so not Karlsson, but maybe someone who can push down a lesser winger in the top nine. Adding a player now instead of at the deadline is an option, and I don’t believe in taking options off the board for future what ifs. Starting next summer, and continuing for the foreseeable future, the Leafs will be making hard decisions about who should be on their team, who they can afford to keep, and who they need to move out to replace with a cost-controlled player. But one of the truisms of hockey is that you can’t carve these plans in stone in advance. Not even the Leafs can’t look at next year’s cap and assign a salary to all of the pending RFAs (other than Matthews) with any confidence that the amount is even in the ballpark. They can’t even be sure every one of those players is going to be on the team, and they can’t assume that any of the players signed this summer like Lindholm and Ozhiganov are any good. There will always be an element of act now and let next year’s cap be next year’s problem for a contender. It’s a scary place to live in, particular for people who like caution. But it’s not good cap management to make decisions based around fitting every $3 million worth of fringe players on your team forever more. Being forced to rise above the endowment effect or the sunk cost fallacy and evaluate those players properly is a good thing. The goal now is not conservation of every player who is now or might be good in the future. The goal is to maximize the number of wins you get by getting the best possible roster that fits under the cap for the entire season, every season, for the next nine years. If a year of John Tavares is too precious to waste, throwing away a year of Auston Matthews is really unconscionable. So if the right play is to use that space now, there is no good reason not to. There’s no more wait ‘till next year. Next year is now.